Sometimes it is good to take photos from another perspective. This can be done by getting lower to the ground, but the opposite is also possible of course. You can stand on a ladder or even use a drone, but in my case I went out flying with a good friend in a small two person single engine Diamond DA20 Katana plane. While driving early in the morning to Lelystad Airport, located in the province Flevoland, the Netherlands, we passed by many fields filled with bulb flowers, like tulips. The flower fields in this region are actually lesser known to tourists who come to see the flower fields in this season; the most visited flower fields are actually located in the western part of the Netherlands. 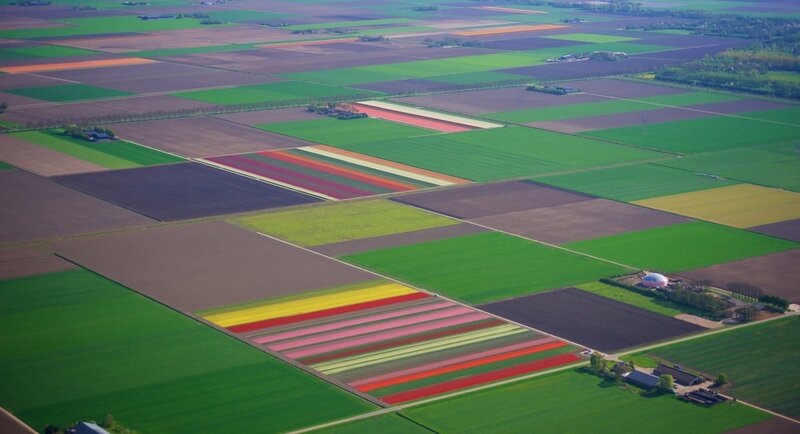 After preparing the plane for its flight and getting into the air we saw several flower fields with bright coloured bulb flowers scattered around the landscape below us. I had the feeling that taking photos from above could result in something interesting, even though many fields were not filled with flowers in bloom. After a day of flying, we flew back to Lelystad Airport late afternoon. During our descent we enjoyed a fantastic view of all the square shaped farm fields, including with some bright coloured flower fields. Before we landed I took a final photo on which the landscape looked like a true patchwork quilt pattern from above. This blog is intended to give you an insight of my photos, including background stories.